In this riveting and highly anticipated tale of temptation, grace, and unconditional love, "New York Times" best-selling author Francine Rivers delivers big-canvas storytelling at its very best. Francine Rivers is one of my absolute favorite Christian fiction authors. Her books are just perfection. Any time I start one of her stories, everything in my life goes on the back burner. I find it nearly impossible to put her books down once I've picked them up. And Bridge to Haven was no exception. This book was one worth ignoring my family to read...and read...and read. I was drawn into the story from the very first page. Baby Abra is born under a bridge in the town of Haven, left by her mother, and discovered by the small town's pastor. Pastor Zeke and his wife take the baby in and name her Abra. Because of the circumstances surrounding her birth, and those regarding her adoptive mother, Abra has always felt unloved and unwanted. She grows up resentful and eager to leave Haven. And she leaves the town at the first opportunity---hand in hand with a dangerous young man bent on using her for his own gain. Abra's sad story reminded me a lot of Angel's in Francine Rivers' earlier work, Redeeming Love. Of course the circumstances are different, but there were some similarities between the two women, and this was a good thing. Reading Bridge to Haven made me want to read Redeeming Love again (for the, oh, fifth time?). Bridge to Haven is a long book, and could have easily slowed down during parts. But, Rivers' pacing is perfection and the story moved at a pace that made it very difficult for me to put the book down. Abra's story is so tender and heartfelt. I found myself tearing up more than once as I read. Her journey to faith was so meaningful and emotional. I loved the relationships as well----Rivers excels at developing characters and the characters in Bridge to Haven are what made the book so special. 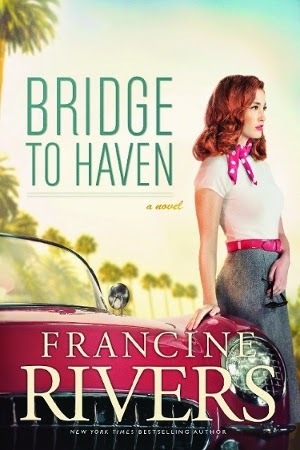 Bridge to Haven is Francine Rivers at her best. I loved everything about this book, and can't wait for her next release! Nooooo! You have to read them! Start with Redeeming Love. It's fantastic!